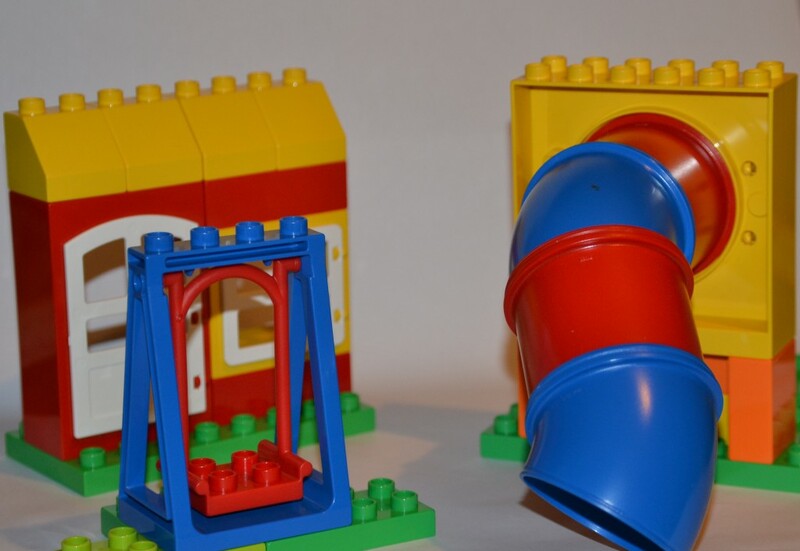 Last week we reviewed the Creative Builder set from LEGO Education, this week is the turn of the DUPLO Playground set. This set comes with 104 pieces, as well as two activity cards and a teacher book full of activity ideas. To start with we built everything up. My four year old managed to build everything easily while my 2 year old needed a bit of help. The hopscotch was great fun to put together and fantastic for number recognition. One of the cards shows a scene in a playground with two children at the top of the slide and another at the bottom building a sandcastle. We recreated the scene and then talked about what might happen and what we could do to change it. This set was great for role play, H especially has spent a long time moving the people around, making them go down the slide or in the cars and talking to them. We used the see saw to talk about weight and balance. My 4 year old explained to me that in this situation one end was heavier than the other which is why it has tipped up. To make it balance we needed the same weight on each side. 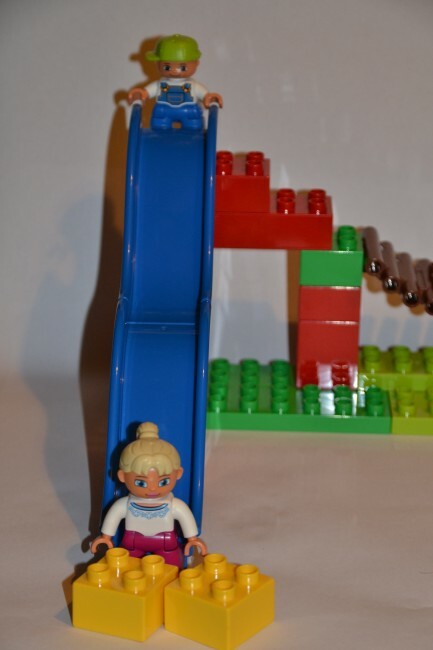 The slide below comes with a yellow ball, S and H like to sit DUPLO people at the bottom and push the ball down to knock them over. You can see lots of shapes in the bricks below. We have been building different scenes and counting the number of circles and squares. 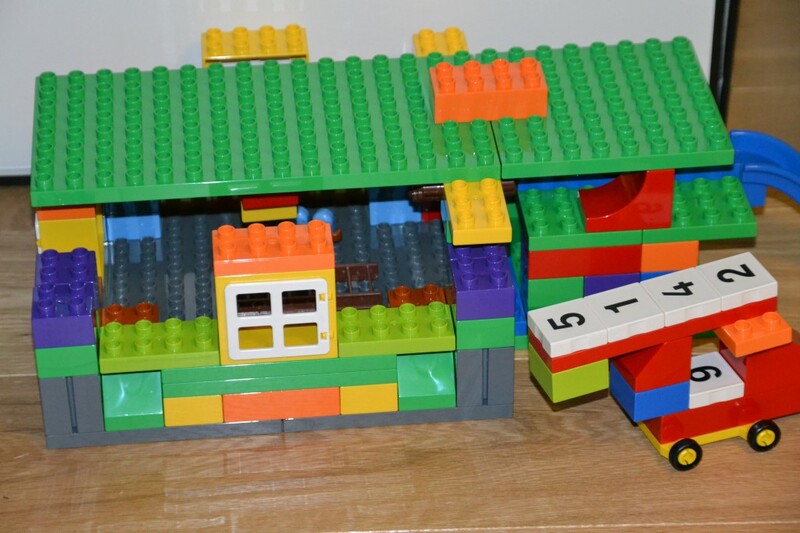 Z likes to build freely with DUPLO, this is his creation using bricks from the Creative Builder and Playground set. It has a bridge and stairs inside as well as a slide to get down from the top floor. We also made a ramp and tested how far the cars moved when they had different sized bricks on them. Z and S spent ages on this activity. The teacher activity book has some great ideas for how to guide play with this set, I think it is a wonderful addition to any DUPLO collection or perfect as a first set to own. This video shows the set in action. 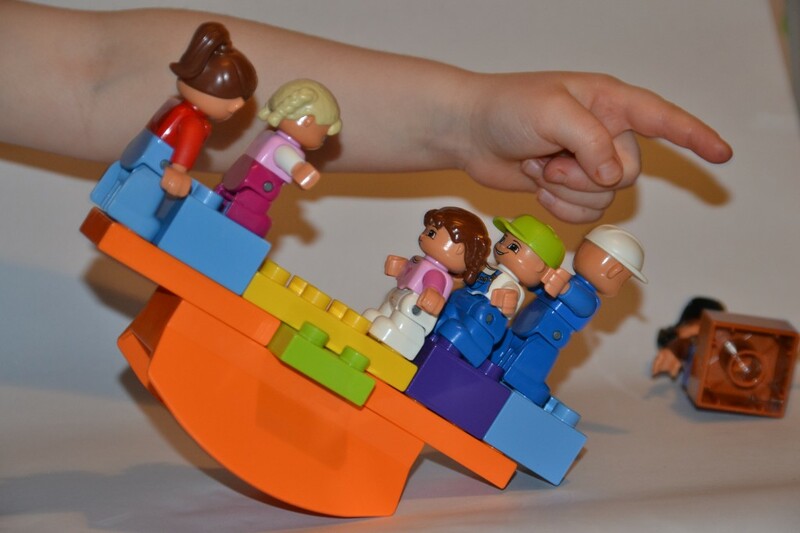 LEGO® Education sets are designed specifically for use in education so you won’t find them in retail shops. They are a little more expensive than regular DUPLO sets, but are bigger to allow children to play at the same time and come in durable storage boxes with holes in the bottom so the bricks can be cleaned easily. Each set also come with activity ideas to help you get the most from the product. 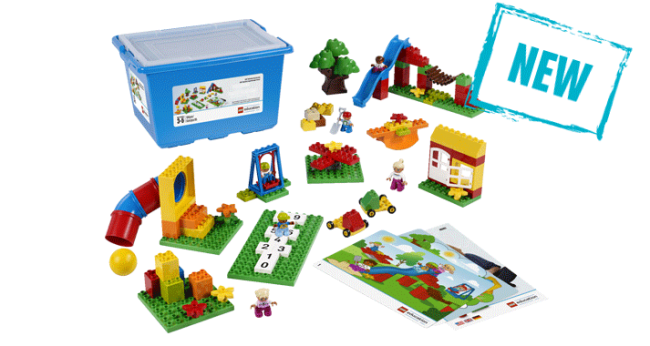 I really think that these sets from LEGO Education are fantastic for parents at home, like me, who want play ideas that are both fun and educational. I would never have thought to ask the children to build a specific scenario like the activity card does and then find a solution, but after trying it once and seeing how engaged my children were during the activity I’m inspired to think of my own scenarios for us to build and talk about. Both these sets have given me lots of ideas for new activities to try, they have been invaluable to us already. We were sent the playground set for the purpose of this review.